In a former life I used to run new writing nights and was treated to a wide variety of skill levels and delivery, so when approaching Bare Essentials, the theatre new writing night from Encompass Productions, I was uncertain what to expect. Packed out at the Seven Dials Club in Covent Garden, the audience was appreciative and keen as Creative Producer Liam Fleming provided an energetic and humorous introduction to the evening. 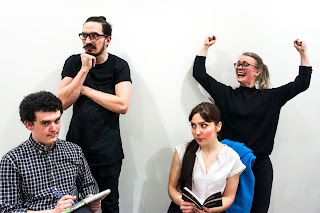 Treated to six short plays with only minimal set pieces, this was a powerful and creative night during which the performances matched the high standard set by the writing. What follows are brief summaries and my thoughts on the pieces presented. This short play saw an interaction between a veteran and a waitress and dealt with themes of adventure and belonging. The waitress (Liz McMullen) was charming, though I felt the veteran's (James Unsworth) awkwardness lacked a bit of subtlety, leading to a slightly misjudged performance, perhaps a result of the direction. However, it was a neatly told story and one which made for a solid start to the evening. A young actress shows up to a first date wearing a hijab and her date's response reflects the fear of other which is so prevalent in our society right now. Ahead of DT's discriminatory Muslim ban, this felt like a timely piece. The actress recounts the abuse she has encountered throughout her day, finally revealing that she is not in fact Muslim. In an act of defiance she refuses to remove the hijab when her date is visibly relieved at her revelation. We need more stories like this which show us what it's like to step into other people's shoes. Great performances from Charlotte Peake and Eddie Usher. Laugh out loud funny, this was a brilliant end to the first half of our evening. An employee at Radio 4 has an innuendo filled conversation with the author of a radio play about someone with tourettes syndrome, and must then sell the concept to his producer. What follows is a hilarious negotiation of which expletives can stay and which must go. I particularly enjoyed the description of the average Radio 4 listener. A clever and witty piece of writing delivered perfectly and plum-ily by Alexander Pankhurst and directed with a keen eye by our host for the evening. In this bizarrely moving piece two old, down on their luck friends discuss the ins and out of a proper breakfast. One is confined to his tent, and visibly unwell while the other plays carer to him. A couple of brilliant performers (Ian Macnaughton and Mark Keegan) made this melancholy tale one to remember. Have you ever wanted to listen to other people's internal voices? 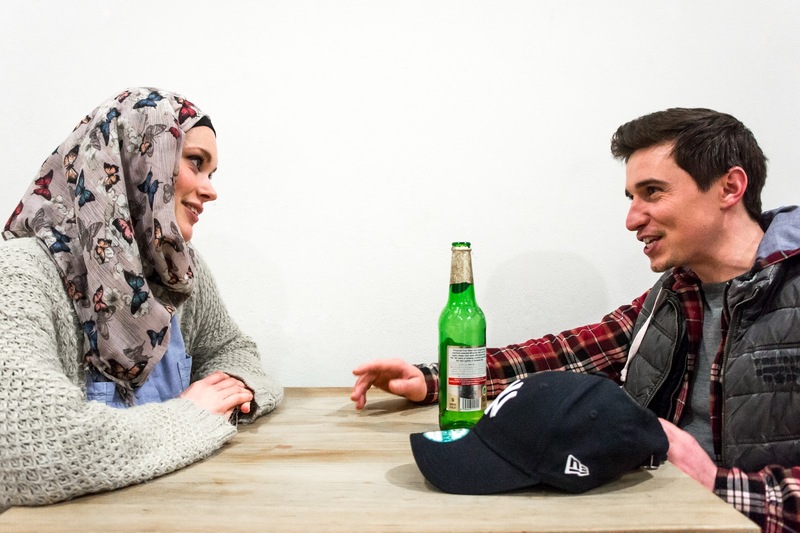 This inventive play displayed an encounter between two people in a cafe, both of whom are attracted to one another. The characters were joined by two accompanying actors who played the energetic and amusing internal monologues. Insecurity and miscommunication abound leading to a failed attempt to connect. There was a strong set of energetic performances in this one, and I could well imagine this as a segment on a comedy sketch show. A touch of science fiction provided the culmination of an interesting evening. My theatre going companion proclaimed this his favourite of the night and I can appreciate why with a large concept brought to life on a small scale. We witness a series of snap shot scenes with pairs of ordinary characters. This two hander saw performers Louise Beresford and Duncan Mason switching rapidly between scenes while providing narrative interjections. As stars begin to die at a rapid rate, and the sun comes under threat, this characters find themselves embracing honesty in a way they haven't before. It is quite rare to see an evening of new writing which is of such a consistently high standard, I would not hesitate to attend again, and I strongly recommend it to others.